I’m a huge fan and history buff of the original Three Stooges. Back then, they would produce two-reel 20 minute “shorts” that were shown before a movie would start at the cinema. Nowadays we have to endure an endless litany of undesirable advertisements before movies start – which is usually not until 15 minutes after the broadcasted start time. Not all progress is good progress. In any event, whether you like the Stooges or not, they have a very interesting history of contract negotiations, from which there is a lot to be learned. 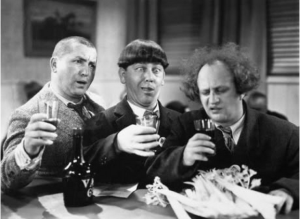 They signed their first contract as the Three Stooges in 1934. It was an annual contract, for a reasonable rate of pay for actors just breaking into the business. Columbia Pictures was run by a person by the name of Harry Cohn, who ruled with an iron fist, and he negotiated the exact same way. He was known as “King Cohn” by his underlings, and that was not considered a compliment. The Three Stooges were immensely popular, but Cohn would never let them know it. He isolated them from public demand for their comedy. He would cruelly make them sweat out their contracts to the last minute every year, before finally agreeing to renew them for another year. In doing so, he would say “the market for shorts is dying out, fellas.” The Stooges took the bait and felt lucky to get a renewal. They endured 24 years of 11th hour annual contract renewals, and because of their fear of not getting a contract at all, they never once asked for nor did they ever receive a raise. It was nothing short of highway robbery on Cohn’s part. What the Stooges lacked was market information. They didn’t do their benchmarking. They didn’t talk to other studios to see what they would pay for their services. They didn’t put their services out to bid. They also didn’t know that Columbia Pictures would use the popular Stooge shorts to force cinemas to also buy their B quality movies that were otherwise in little demand. They came together as a package. If the cinemas wanted the Stooge shorts, they had to buy the B quality movies too. The Stooges didn’t know any of this. Knowledge is power in negotiations. You can’t always believe what the other side is telling you. If they tell you they may walk from the negotiations, you have to test that. You have to be able to call the other side’s bluff, and the Stooges didn’t know how to do that. They were masters of their craft, but they were complete novices at the art and science of negotiations. As a side note, they did not think to negotiate safety measures either. They were the victim of broken bones, teeth, and stitches, as they performed many dangerous stunts themselves. Do you verify when a supplier tells you that they may walk from a deal? Do you take measures to ensure that you can call a supplier’s bluff? Do you let lack of information lock you into bad TCO arrangements? Do you let contract renewals work for you or against you? Do you step up the competition when you think a supplier is charging too much? Suppliers are trained to make you think you have left them bloody and bruised after negotiations are over, even if they are in fact laughing all the way to the bank. Harry Cohn was the master of this. He did it for 24 straight years with the Stooges. Information gathering is critical to verify that what a supplier wants you to see and believe is really what’s happening. Information + competition = power and leverage in negotiations. I know I did without both in my first negotiation as a purchasing professional. The results were predictable. I would have made the Stooges proud, but that’s not a good thing.